December 5, 2017 – AlivePromo completes install of digital kiosks at the Galleria Edina. 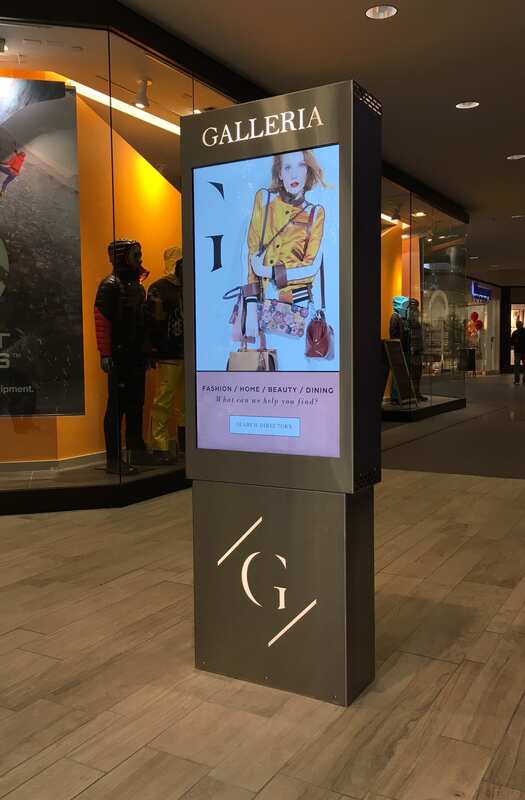 AlivePromo, Inc. in Minneapolis, Minnesota, a long time leading provider of digital display solutions for commercial properties completed an install of several digital kiosks and signs at the Galleria in Edina, Minnesota. Visitors to the luxury brand and dining destination will now have the latest in digital kiosk technology to help them navigate the ever expanding shopping venue. “We are really proud to have been selected to design and install custom digital kiosks and signs for Galleria”, says Sam Rogers, CEO and President. Rogers explains that the fixture designs are uniquely designed for Galleria and feature a small footprint concept, while still maintaining a meaningful scale. High quality Minnesota fabricated materials and unique logo effects add to the stunning digital visuals and mapping designed by AlivePromo’s creative staff. The Galleria marketing team can update content on the fly with AlivePromo’s AlivePulse™ content management system. Edina Galleria is an upper Midwest shopping destination offering the finest in fashion, home, beauty and dining. Located just 10 miles from downtown Minneapolis in Edina, MN, this is where luxury meets lifestyle. In addition to well-known national and international brands including David Yurman, Eileen Fisher, Louis Vuitton, kate spade new york, Tiffany & Co., Restoration Hardware, Tumi, Allen Edmonds and Chico’s, Galleria also features outstanding local stores such as Twill by Scott Dayton, Ampersand, Hammer Made, Melly, Fawbush’s, H.O.B.O., Pumpz & Co., Trail Mark, dugo and Scheherazade, among others. Our easily accessible location is just one reason shoppers from Minneapolis-St. Paul, greater Minnesota, and the upper Midwest choose Galleria for luxury shopping and dining. Our shoppers also have access to the beautiful Westin Edina Galleria through a climate-controlled walkway. Galleria offers a comfortable shopping environment featuring water elements, seating areas, and a concierge area for shopper assistance.